For some reason, I've always been under the impression that soft pretzels were really difficult to make. High maintenance, time consuming, and finicky. Seems like I'm saying this a lot lately, but I've been proven wrong. Bigtime. Making these pretzels was the most fun I've had in the kitchen in a while. Not only did I get to do my new favorite thing ever (watching dough rise... I know, I lead a thrilling life), but the twisting and the boiling and especially the eating made these a perfect Saturday afternoon activity. 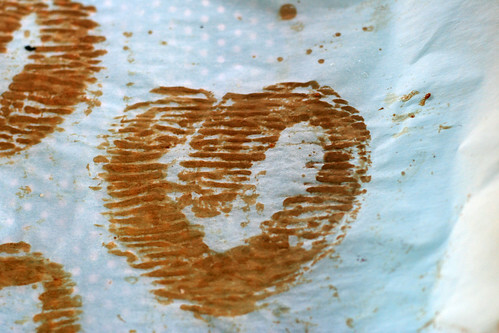 I think these would be especially fun to make if you have kiddos around to help you. I call this one Pretzel on Parchment. It's hanging on my fridge. Let me know if you try making these... free admission into my Homemade Pretzel Fan Club! 1. Combine the water, sugar and kosher salt in the bowl of a stand mixer and sprinkle the yeast on top. Allow to sit for 5 minutes or until the mixture begins to foam. Add the flour and butter and, using the dough hook attachment, mix on low speed until well combined. Change to medium speed and knead until the dough is smooth and pulls away from the side of the bowl, approximately 4 to 5 minutes. Remove the dough from the bowl, clean the bowl and then oil it well with vegetable oil. Return the dough to the bowl, cover with plastic wrap and sit in a warm place for approximately 50 to 55 minutes or until the dough has doubled in size. 2. Preheat the oven to 450 degrees F. Line 2 half-sheet pans with parchment paper and lightly brush with the vegetable oil. Set aside. 3. Bring the 10 cups of water and the baking soda to a rolling boil in an 8-quart saucepan or roasting pan. 4, In the meantime, turn the dough out onto a slightly oiled work surface and divide into 8 equal pieces. Roll out each piece of dough into a 24-inch rope. Make a U-shape with the rope, holding the ends of the rope, cross them over each other and press onto the bottom of the U in order to form the shape of a pretzel. Place onto the parchment-lined half sheet pan. 5. Place the pretzels into the boiling water, 1 by 1, for 30 seconds. Remove them from the water using a large flat spatula. Return to the half sheet pan, brush the top of each pretzel with the beaten egg yolk and water mixture and sprinkle with the pretzel salt. Bake until dark golden brown in color, approximately 12 to 14 minutes. Transfer to a cooling rack for at least 5 minutes before serving. These are by far my favorite pretzels to make! Alton never fails!!! I'm starting to investigate bread (just bought Amy's bread and am dying to get started on making the sourdough). Will definitely have to try these! I have been DYING to make soft pretzels and I've seen the Alton's Good Eats episode on how to make them. One of my fave foods in life! Yours look perfect and you are totally motivating me to make them! Your post reminded me of how much I love soft pretzels! I'll have to try the recipe on my next marathon cooking session at home! I will have to try these with my son! 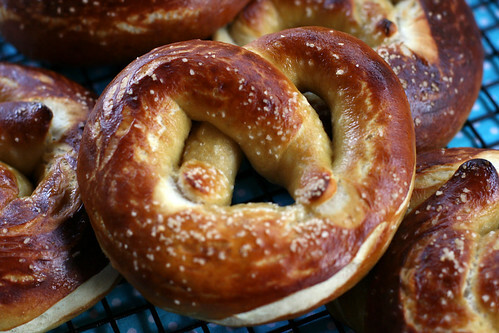 Nothing beats a great soft pretzel, especially when you make your own. Something about the smell and texture. Great work!